Ready for a new brownie recipe that doesn’t call for flour, refined sugar or artificial anything? Super easy to put together; just cream the beans and eggs together in your favorite blender/food processor. Melt butter on low heat in a small saucepan while adding the rest of the ingredients to the bean/egg mixture. When butter is melted, add it to the batter slowly while mixing. Pour brownie batter into a butter 9 x 13 baking dish and bake for 35-40 minutes @ 350°. *To prepare beans, follow instructions on package for soaking and cooking beans. (You will cover beans in water and let sit overnight, then cook on low heat for a few hours until they are soft.) This helps you avoid chemicals in canned beans and is very cost effective. But, if canned beans are your only option, they will work as well. Beat all ingredients together with a hand mixer until smooth. Spoon into a zip lock bag or a frosting bag. Chill in the refrigerator for an hour, to allow it to set. Then cut a small hole in one corner of the bottom of the plastic bag (or use frosting bag with decorator’s tip) and squeeze in swirls on top of small squares of brownies once the brownies are cooled. 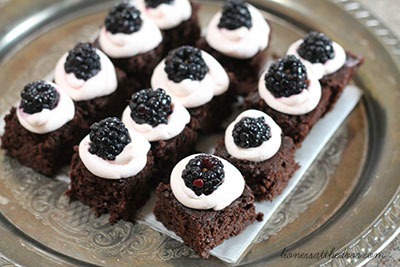 We used black berries (cut in half length-wise) for garnish, but raspberries, blueberries, strawberries or shaved chocolate would be lovely too! 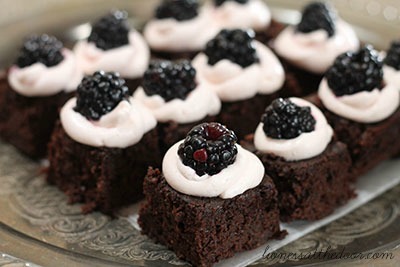 *Remember, sweet treats, even those made with real food ingredients, should be reserved for special occasions and served in small portions. Think of it as training your taste buds to prefer foods that are less sweet, less processed and eaten after nutritious meals, and not used as snacks. You and your family will be better off in the long run employing this healthy habit!